Explorathon 2015, 25 September: come to the Gallery of Modern Art & try artcasting!The muse in the magic? 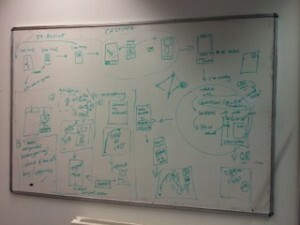 On Friday 25th September the artcasting team excitedly arrived at the Scottish National Gallery of Modern Art ready to test an early prototype of the artcasting platform for the first time. Throughout the afternoon and evening, friends, colleagues and members of the public interested in our research dropped in to try the artcasting platform, spending time in the ARTIST ROOMS: Roy Lichtenstein exhibition. 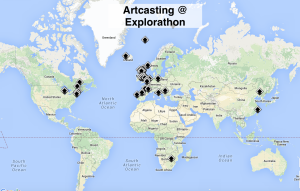 The event was largely aimed at those pre-registering to participate in Explorathon, but artcasting also attracted a few extra gallery visitors on the night. Our project team focus for the evening was to get visitors using the initial ‘casting’ process in the context of the ARTIST ROOMS Lichtenstein exhibition. Visitors were able to select artworks of their choice and (re)locate them in the context of a world map, name their cast and add some contextual information (why they cast the artwork to a given place). Those unsure where to cast the artwork (which was just a few people) were able to access some prompt questions to help them identify a location. 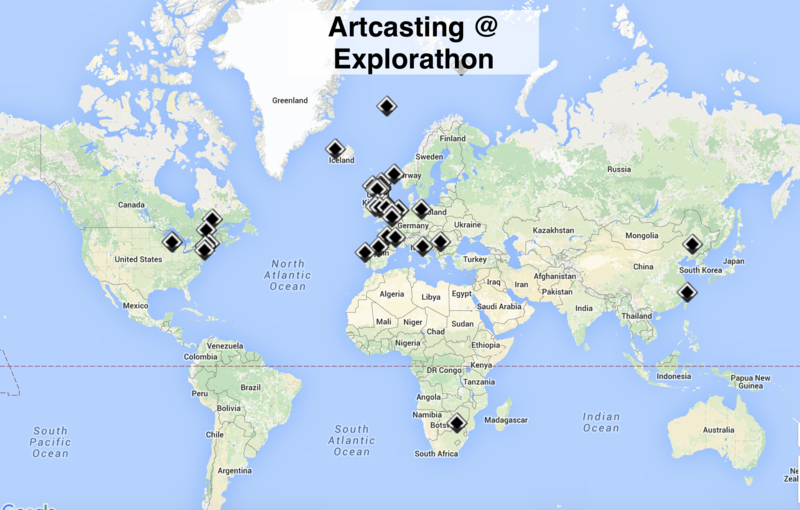 Finally, visitors were able see their (anonymous) casts displayed on a world map in the context of all the other casts generated during the event. A total of 68 casts were generated by 28 participants during the event. From the artcasts themselves, written feedback and and informal discussions with visitors, we were able to explore the ways in which the concept of artcasting had been interpreted and used. 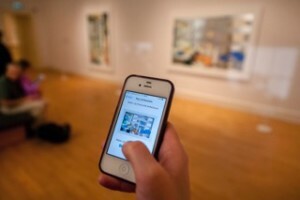 We found that some people thought the value of artcasting lay in its ability to learn about art and to make connections between artworks, artists and general art movements. Other visitors cast artworks in the context of connections made between artwork, memory and place. Another group of visitors used artcasting in ways that didn’t quite these first two approaches but demonstrated the potential of artcasting to explore connections between place and journeying. What next? The data captured during Explorathon was discussed during our team ‘deep day’ on 14th October and the functionality of the artcasting platform agreed so that Chris (Barker) could continue with the development and Sigrid with the design of the app. Our two artcasting pilots are launching in the week of 23 November. The conversations, feedback, and examples of artcasts at Explorathon gave us some incredibly valuable insights and have helped push us into the next stage of development with great energy and some fresh ideas. Thanks to our brilliant colleagues at National Galleries of Scotland and ARTIST ROOMS for helping make the event happen, and to the Explorathon organisers at Beltane for including us in the programme and for their help on the day. Artcasting will be available to all visitors to the ARTIST ROOMS: Roy Lichtenstein exhibition at the Scottish National Gallery of Modern Art between Monday 23 November 2015–Sunday 10 January 2016. Artcasting will be available to all visitors throughout the ARTIST ROOMS: Robert Mapplethorpe exhibition at the Bowes Museum. opening Saturday 28 November 2015. We will launch artcasting at the preview event on Friday 27 November.